Days of Our Lives Spoilers: Let's Put an End to This Madness! 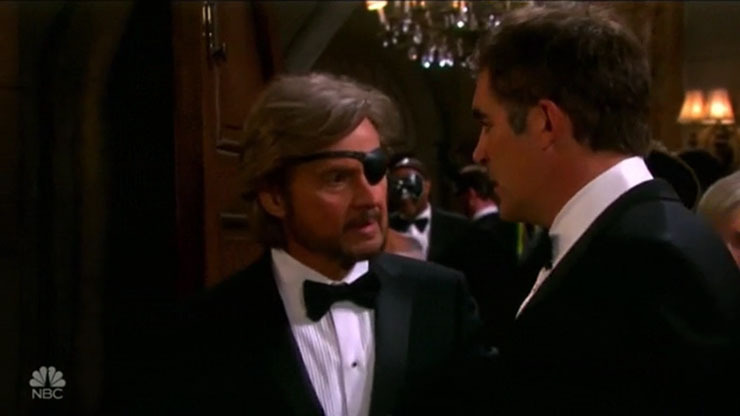 Steve has high hopes for…well, Hope, in the “Days of Our Lives” spoilers. “Days of Our Lives” spoilers for Friday, February 10th predict that three Salem faves team up to find another two who need their help desperately. A Salem love triangle rushes to save a would-be Salem supercouple. Kate (Lauen Koslow), Andre (Thaao Penghlis), and Eduardo (A Martinez) decide to put their heads together to find Chad (Billy Flynn) and Gabi (Camila Banus). It’s always nice to see a soap opera motley crew unite in pursuit of a common goal. Especially when the goal is for good and not evil! Enough with the Orwell Device already! Doesn’t it seem like Chad and Gabi are always in tight spots–literally–together? Like when they stripped down to their skivvies in the DiMera panic room? Anyway, this is a much more dire situation. Gabi tends to Chad trying to keep him alive in spite of his serious injuries. Even though we know he’s going to pull through, it’s still somehow nerve-wracking to watch him struggle. Gabi doesn’t make things easier by panicking like she did with JJ when he was shot. No More Robes With an Open Back! Meanwhile, Dario (Jordi Vilasuso) is all healed and ready to go. How much do you want to bet he hasn’t learned his lesson after being roughed up by thugs because of this gosh darn Device? He leaves the hospital tomorrow, but something has got to teach him not to get mixed up in anything like this again. Although, what fun would that be? Given that he’s come back from all the he’s come back from, it’s no wonder Steve (Stephen Nichols) is an optimistic fellow. Tomorrow he notes to Rafe (Galen Gering) that he is has faith things will work out for Hope (Kristian Alfonso). Maybe in addition to optimism it’s a knowledge that his good friend, the Hope-ster, has come back from her own share of seemingly insurmountable hurdles over the years! Previous ArticleHow Does the Cast and Crew of General Hospital Do It?!?!?! Next Article General Hospital Spoilers, Friday, February 10th: Hayden to the Hospital’s Rescue–Stat!